I’ve got some brewing thoughts about what comes next, in line with and in some cases following on from what others, made of stronger stuff and able to drag words out rage and despair more quickly than I, have already written. But this month’s Supermoon is special. The eccentricity above is calculated based upon the Earth-Moon system, but other celestial bodies also influence the Moon’s orbit through gravity. The Sun plays the largest role, but so too does Jupiter and even some of the smaller planets. When factoring in these other influences, the eccentricity of the Moon’s orbit can actually vary by as little as 0.026 and as much as 0.077. A more eccentric lunar orbit brings the perigee [its closest approach] nearer the Earth, and when this perigee occurs during a full Moon, we get an extra-Supermoon. That is what will happen on Nov. 14, when the Moon will come to within just 356,509km of Earth, which is the Moon’s closest approach since Jan. 26, 1948. The Solar System won’t line up this well again for a lunar approach until Nov. 25, 2034. That sucker is going to be big, really big –a “normal” Supermoon is 14 % larger and 30% brighter than a full moon at apogee — the point on an elliptical orbit farthest away the focal body. It’s actually hard to perceive the effect as a casual observer, but it is naked-eye detectable. The absolute peak of the phenomenon comes at 8:25 a.m. ET this coming Monday, but if you’re up early and/or catch the rising moon Monday evening, you’ll get a fine approximation. As they say: check local listings. One of the consolations/delights I take from nature is the sense of connection to something larger than myself. That’s the same feeling I get from the acts we take to make the world better, from the kindness we show to one person at a time to the actions we’re stumbling to figure out right now, here on this blog and at every turn. I’m going to stare at that moon Monday (sky permitting) and think of the world I want the next time this particular geometry rolls around, twenty eight years from now. My son will be thirty four then. If I’m fortunate enough to be here with him, I’ll be seventy six. It will be a better world then, if we make it so. And if it makes me a lunatic to think so, I’ll take that label gladly. Beats the alternative. 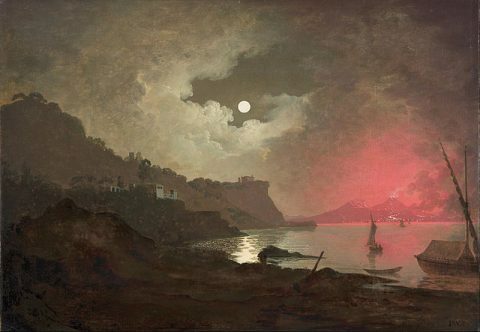 Image: Joseph Wright of Derby, A view of Vesuvius from Posillipo, Naples, between 1788 and 1790. There be dragons out there, waaaaay out there, in the dark, off the edge of the map. The new analysis, by two Caltech astronomers, theoretician Konstantin Batygin and the observer and Slayer-of-Pluto Michael Brown, has led to a broad outline of what to expect — a ~10 Earth mass planet travelling a very eccentric orbit that never comes closer to the sun than ~250 Earth-Sun distances, a unit of measure known as the Astronomical Unit. I couldn’t be more excited by the news. I sometimes forget what an extraordinary run of solar system exploration I’ve been privileged to witness. The variety we’ve found exists in our near-environment has leapt unbelievably, just in the last two or three decades, and the richness and complexity of our own solar system is allowing us to make more sense of the process of planet and planetary system formation as more and more data emerges about exo-systems. But for all that excitement, there’s something special about a new major planet. As I write in The Hunt for Vulcan [Shameless Plug Here], the idea of a whole new world joining the neighborhood had enormous romantic power in the eighteenth and nineteenth century. Arguably, given our present immersion in the imagined reality of multiple worlds, that romance cuts deeper still today. 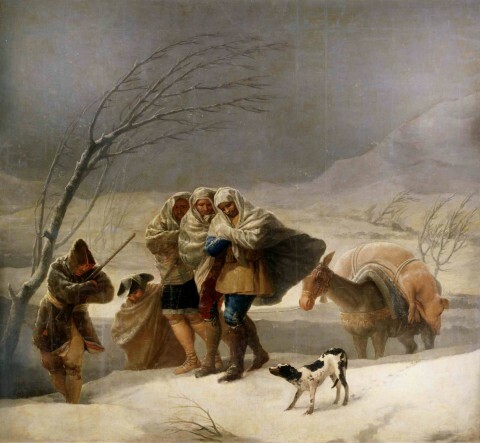 …Le Verrier himself was one of the first to be fooled by the impeccable logic of Newton’s theory. 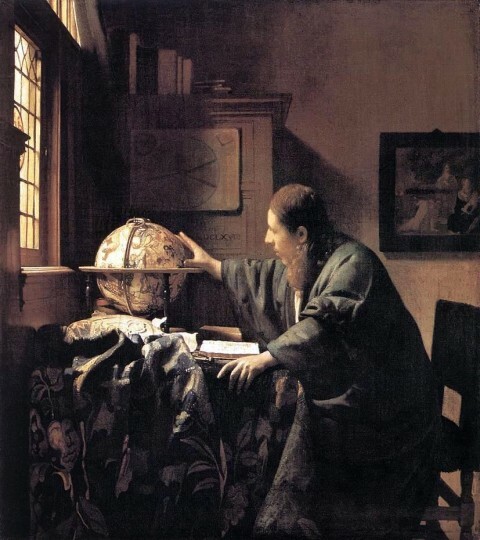 After Neptune, he turned his attention to the inner solar system, and he showed (correctly) that Mercury’s orbit wobbles in a way that a Newtonian accounting couldn’t explain. With his own recent triumph so fresh in his—and everyone else’s—mind, the explanation was obvious: There must be a planet hidden in the ferocious glare of the sun, one soon dubbed Vulcan. Within months of making that prediction, Le Verrier trumpeted as a settled discovery an amateur astronomer’s claim to have seen Vulcan crossing the face of the sun. Over the next two decades, at least a dozen other reputable observers reported similar sightings. The only problem being, of course, that Vulcan was never there. There’s a surfeit of terrestrial crazy to weigh us down. It’s a relief, I find, to look up and out, and contemplate the ordered mysteries that so thoroughly dwarf Comrade Trump’s Yuuuuuggggge self conceit. So it’s here — Publication Day! The Hunt for Vulcan is now live. There’s a bit of backstory on how the book came to be over at Gizmodo. Spoiler alert: Ta-Nehisi Coates bears part of the blame. More backstory on Einstein’s role in all this here. 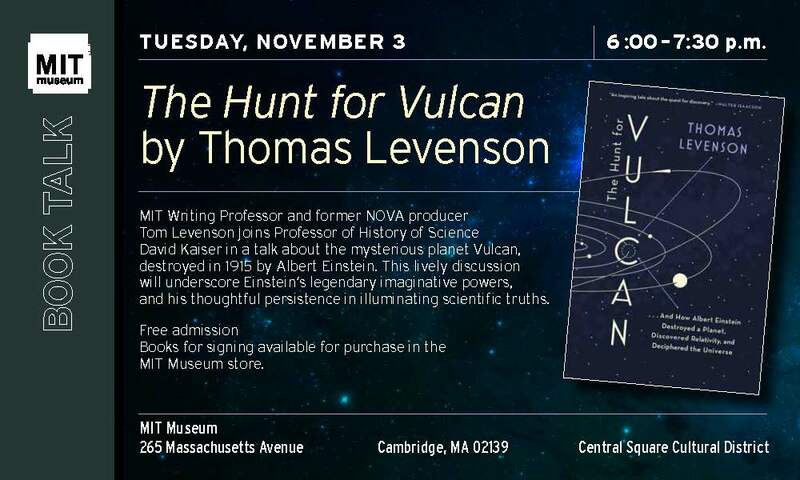 If that doesn’t read too well: I’ll be talking about the book with my colleague, the wonderful physicist and historian of science David Kaiser at 6 p.m. We’ll be at the MIT Museum — free and open to the public. If you can’t make it, there will be alternatives. And with that: shameless self promotion at least temporarily brought to a halt. You’ll forgive, I hope, the self promotion here, but I want to draw attention to an essay I have in The Boston Globe today. It’s about the controversy over the Thirty Meter Telescope (TMT) that is beginning to be constructed at the summit of Mauna Kea on the Big Island of Hawaii. Mauna Kea is one of the world’s most significant sites for optical and near infrared astronomy — it’s already home to thirteen telescopes, including the two largest now in operation in the twin Keck instruments. The TMT is designed to have a primary mirror three times the diameter of the Keck ten meter light buckets, with nine times the light gathering area. Over the last century — which covers the era of large, mountaintop optical observatorys, each similar leap in telescope size has produced startling, powerful discoveries, and there’s every reason to expect the same of the TMT and its planned southern hemisphere counterparts. But there’s a catch — or something more fundamental than a mere glitch. Mauna Kea is a sacred site within the Hawaiian tradition, and an environmentally sensitive one, and opposition to TMT has grown from a point of tension to one of direct confrontation. Construction of the TMT has been suspended, and the governor of Hawaii has called for the removal of a quarter of the existing observatories before the TMT itself begins operating. ….the TMT dispute shows where the science versus religion trope goes wrong. 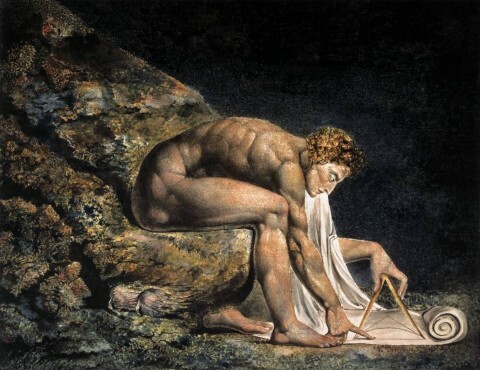 The Hawaiian protesters haven’t said that Mauna Kea’s telescopes are inherently impious, or that the data they collect is somehow wrong, or that Hawaiian mythology is a better account of the cosmos. Rather, the value, the joy, the need the observatories satisfy may indeed satisfy many, but not those continuing a Hawaiian tradition that allows its heirs to find connection with memory, with history, with nature — to achieve the same transcendence sought by those who find beauty in the measure of the universe. That is: The TMT defenders and their opponents seek analogous rewards from their presence on Mauna Kea. Their conflict isn’t between the competing worldviews of science and religion, but between desires that are kin to each other — and that require the same physical space. Check it out, if your Sunday afternoon tends that way. Let me know what you think. 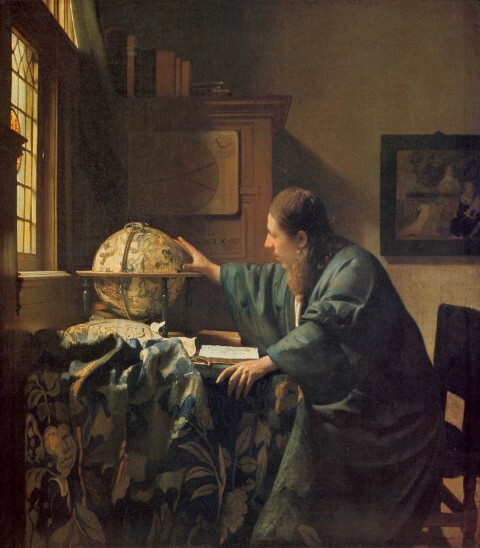 Image: Johannes Vermeer, The Astronomer, c. 1668. We can’t just live on a diet of alternating snark and rage at the feral Republican children trying to burn down the House. Rather, we could — but that’s like suffering the health effects of a day-after-day Super Size Me diet of political high fructose corn starch and a bucket of Krispy Kreme’s — and I, at least, need some happier stuff from time to time just to remind me that the world isn’t simply a playground for the worst of us. Hence this delightful tale, via my science writing friend David Dobbs, who led to this gem from David Quigg, proprietor of the Two Many Daves blog. The link takes you to a post ostensibly about Quigg’s ongoing pursuit of Ernest Hemingway’s FBI file — in which he’s making progress, but still faces G-manned roadblocks between him and what he really wants to know. Quigg (deliberately, I suspect) buried the lede. Hemingway’s a side show. The really sweet tale he’s managed to extract from the Great Redactor introduces a new character, Harvard astronomer Harlow Shapley. Shapley had a mixed record as an astronomer — he picked the wrong side in the famous Curtis-Shapley debate on whether or not the spiral nebula that had been observed by 1920 lay inside or outside our Milky Way galaxy, and he rather unfortunately thought Edwin Hubble had committed junk science. But he had the right enemies. A political liberal and friend of Henry Wallace, he was targeted by Joe McCarthy,* which is what landed him in the FBI files that Quigg received. According to Dr. Shapley, he and Frost met at an annual faculty get-together during one of Frost’s stints as poet-in-residence at Harvard. Frost sought Shapley out, tugged at his sleeve–figuratively, if not literally–and said something like, “Now, Professor Shapley. You know all about astronomy. Tell me, how is the world going to end?”  Taken aback by this unconventional approach, Shapley assumed Frost was joking. The two of them chatted for a few moments, but not about the end of the world. Then they each became involved in conversations with other people and were soon in different parts of the room. But a while later, Frost sought out Shapley again and asked him the same question. “So,” said Shapley to his audience in 1960, “I told him that either the earth would be incinerated, or a permanent ice age would gradually annihilate all life on earth.” Shapley went on to explain, as he had earlier explained to Frost, why life on earth would eventually be destroyed by fire or ice. “Imagine my surprise,” Shapley said, “when just a year or two later, I ran across this poem.” He then read “Fire and Ice” aloud. He saw “Some say” as a reference to himself–specifically to his meeting with Frost at that gathering of Harvard faculty. I should add that the anecdote comes from Tom Hansen, who recalls hearing Shapley lecture about (inter alia) his conversation with Frost. Hansen doesn’t dispute Shapley’s memory of the encounter, but he does point out that the poem itself is not a versification of cosmology, and hence, that Shapley’s puff of pride at his muse’s role is very likely (IMHO too) misplaced. In any event one may — I do — kvell at the thought of those two mutual incomprehensibles sipping sherry whilst thinking such different thoughts fashioned out of the same words. Beats trying to deal with the Repblican’s Boehner problem, that’s for sure. *Shapley’s line on McCarthy’s accusations: “the Senator succeeded in telling six lies in four sentences, which is probably the indoor record for mendacity.” Not bad for an ivy covered professor, I’d say. This is the Owl Nebula — a planetary nebula* visible in the Northern Hemisphere in the constellation Ursa Major. It gets its name from the two dark “eyes” visible more or less along the center line of the image, which to the poetic soul that lives in skywatchers, gives it the look of an owl’s face. It was made at the Gemini North telescope, an eight-meter class monolith at what is perhaps the best single observing site for optical astronomy in the world, the summit of Mauna Kea in Hawaii. The image was produced for the observing program of an atypical user of a major telescope: Émilie Storer, a student at Collège Charlemagne, Pierrefonds, Quebec. Storer was this year’s winner of an annual competition sponsored by the Gemini Observatory, asking high schoolers to write an essay about their favorite object in the sky, and why one of the Gemini telescopes should observe it. In this case, Storer’s choice prompted Gemini’s scientists to create the best available large-telescope data set on this planetary nebula, and thus reveal significant structure within what had previously been thought to be a quite simple ball. Details in the Gemini Observatory press release. I’ve long been a fan of planetary nebulae — you can see a couple in the opening sequence to a film I made, and, as of this writing, 204 more in the archives (search for “planetary nebula) of the invaluable Astronomy Picture of the Day archive. They are beautiful to look at, and, the more you know about them, poignant too — a terribly short lived passage in the life of a star, an eruption of splendor, swiftly to be eclipsed by a dwindling of the light. And I’ve long been a fan of big telescopes on big mountains, and anything that gets people to know and love them. I’ve made a couple of films centering on large ‘scopes, and have spent a lot of time trying to remain sufficiently oxygenated to remember when to turn the camera on and when to call “cut.” I have a particular affection for Gemini North, as it happens, because I had the enormous good fortune to go to the Corning factory in upstate New York as they were finishing and shipping the eight meter mirror blank off to France for polishing. What I saw was twenty ton contact lens, slumped into the rudiments of its curved shape, and through the generosity of both Corning and the Gemini team, I and my collaborator Larry Klein were able to make one of the most spectacular purely visual scenes we’ve ever shot — images of the giant blank, lit blue from below, being gently swept by a pair of moon-bootied men, to be followed by the amazing slow dance of lifting the mirror up and into its crate. Doesn’t sound like much on the page, and that film “Cathedrals of the Sky,” is almost unobtainable now, but trust me, it was great. But I digress. This is just a post for a weekend to give kudos to Ms. Storer and to the Gemini Observatory — and to enjoy a break from the craziness that has overtaken this blog and our country. Here, after all, is a glimpse of genuinely beauty that could not be less implicated in any trouble and strife here on the mote of dust we call home. *Planetary nebulae, despite the name, are the products of a late phase in the life cycle of certain stars. Larger stars — above 8 times the mass of the sun — tend to blow up in spectacular events called supernovae. Lighter stars at the end of their lives don’t undergo the cataclysmic collapse and explosion of their massive cousins (as long as they are not part of a distinct class of stars below 1.38 solar masses that under very specific conditions produce what are known as type 1A supernovae). Instead, as such stars begin run out of hydrogen as fuel for fusion reactions and begin to burn helium (while remaining hydrogen stocks continue to fuse). As the stars core heats up as the more intense helium fusion reactions take over, it becomes less stable (the actual dynamics are ferociously more complicated than this cartoon) and the star begins to blow off its outer atmosphere in a series of concentric shells. 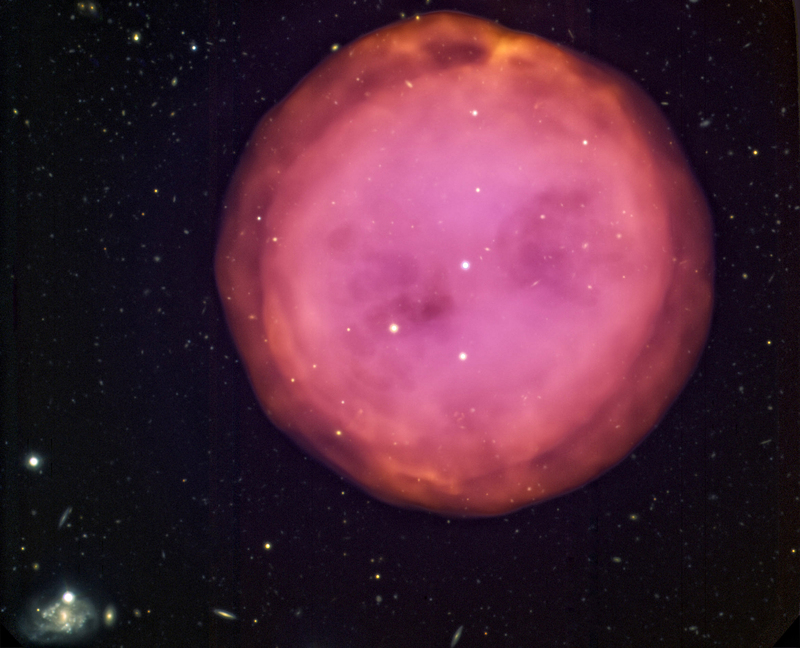 Those expanding spheres of gas form the beautiful shapes and colors we detect as planetary nebulae. It’s always good to acknowledge fine April Fool’s snark. In the science division, let me nominate this dispatch from the cutting edge of optical astronomy. Let me just add from personal experience (very lucky me…see chapter 6 for the scene in this film shot at the Keck Observatory) that the one statement contained therein that is truly true is that one’s brain does indeed slow atop Mauna Kea. 13,600 ft is no joke. In the wee hours one does have trouble working out sequences like this: left foot; right foot; left foot; right foot; le…ri…? But it is truly gorgeous up there, night and day. Update: Should have added the h/t: one of my favorite blogs/bloggers, A Darker View. 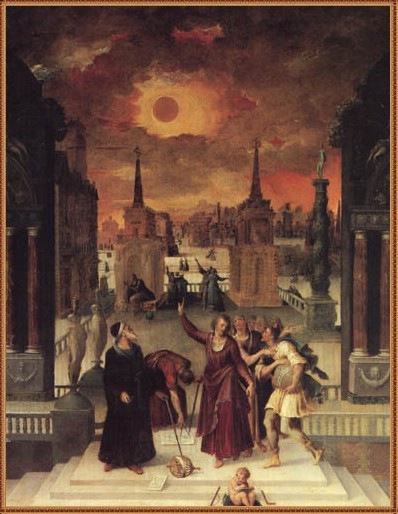 Image: Antoine Caron, “Astronomers Studying an Eclipse,” 1571.